The second set is Russian in origin and they were painted in the 15th and 16th centuries, both of the iconographic School of Moscow. The text in the Lord’s Gospel Book is “Judge not according to the appearance, but judge with righteous judgement (John 7:24). For with what judgement you judge, you shall be judged (Matthew 7:2).” As in many icons of the Lord, His face is both sober, for He looks right into our souls, and yet merciful, for He loves us with a serene long-suffering love. When we look at Him openly, he reveals in a mysterious way a mirror to our soul. 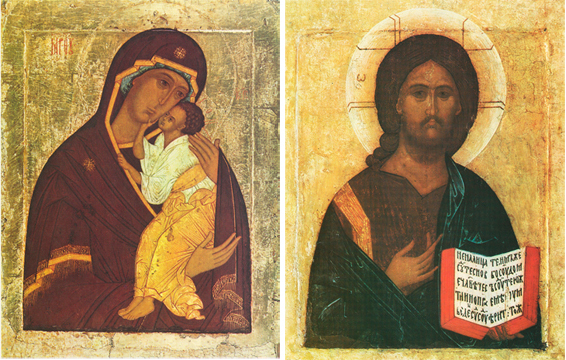 The icon of the Theotokos is a copy of one of the most ancient wonder-working icons of Russia, of the Eleusa or Merciful type. This original was brought to Yaroslavl on the Volga in Western Russia in the 13th century by the Princes Basil and Constantine. The copy here shown is now located in the Tretyakov Gallery in Moscow, among many of the most famous icons in the Russian lands.